No to the Bailout of the Capitalist Speculators! Bring Down the Bourgeoisie Through Workers Revolution! Down with the Dictatorship of Finance Capital! 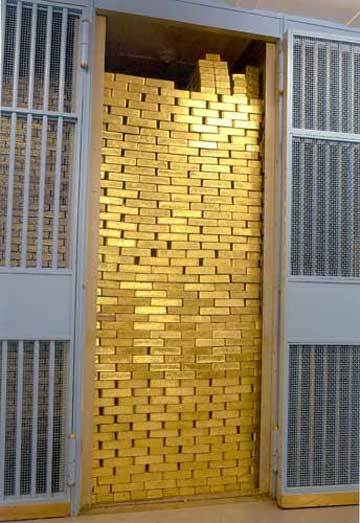 Gold reserves in the Federal Reserve Bank of New York. Since 1971, the American dollar is no longer backed by gold but only by confidence in the U.S. How long will that last? In the last two weeks, the financial crisis that has been heating up since early 2007 reached the boiling point. Credit markets have virtually stopped functioning. A full-blown panic has swept through stock markets worldwide. The capitalist economy is in the throes of a recession that could turn into a Depression lasting for years. Unemployment lines are swelling as almost 800,000 jobs have been eliminated in the last ten months. Foreclosures have thrown more than a million households out of their homes in the space of a year. The incomes of working people are falling sharply. And meanwhile the U.S. imperialists are waging a war without end, pillaging countries from Iraq and Afghanistan to the Philippines and Latin America, demanding that the world bow to their diktat. In these dire economic straits, the Wall Street speculators who set off this crisis are demanding that the government rescue them with a bailout priced at $700 billion. The actual costs will be far higher, possibly a trillion dollars or more. The bankers are holding the economy hostage. The Bush regime holds a figurative gun to the head of Congress, threatening that if it doesn’t come up with the ransom there will be a financial meltdown and the entire world economy will grind to a halt. Their doomsday scenario has added credibility as the capitalist financial system has practically frozen up. Yet there is no indication that this huge bribe will restart the credit markets any more than the hundreds of billions of dollars already injected into the banking system by the Fed have. The Republican administration has been treading a fine line. On the one hand they want to pretend that all is needed is minor “corrections” to a basically healthy economy. On the other hand, they threaten that if their program isn’t passed there will be financial Armageddon. In the aftermath of the Lehman Brothers bankruptcy, Republican presidential candidate John McCain said “the fundamentals of our economy are strong.” Treasury Secretary Henry Paulson declared, “the long-term economic fundamentals of the United States are sound.” As one economics pundit declared, “There is a rule of thumb that when the government proclaims the fundamentals are good, you should sell” (New York Times, 16 September). And if they declare that the “long-term” fundamentals are A-OK, that means big trouble in the short-term and you should sell now. Which is what investors did, sending the Dow Jones and NASDAQ indexes plummeting. The government wants to frighten the general population and browbeat Congress into approving its giant boondoggle by bandying about the specter of a new Depression. Their line is vote for the Wall Street bailout this week, or else. It has many people scared stiff because on Main Street the economic crisis is already here, and has been for months. But voting a giveaway of hundreds of billions to the banks isn’t going to stop anyone from being evicted from their homes or get any jobs for the jobless. Meanwhile, the Democrats are pushing hardest for the Bush bailout of the banks. It is not for nothing that New York Democrat Chuck Schumer is known as “the senator from Wall Street,” and that vice-presidential Democratic candidate Joe Biden of Delaware was dubbed “the senator from MBNA,” the giant credit card company that was sold to Bank of America a couple of years ago. Likewise, today it is the Democratic majority in Congress that keeps funding the Iraq and Afghanistan wars. Democratic presidential candidate Barack Obama blames “greed and irresponsibility” for the crisis on Wall Street (capitalism without greed?) and says there must be no “blank check to Washington” to resolve it. Democratic Senate majority leader Harry Reid repeats that Congress must not grant President Bush a “blank check” with the $700 billion bailout. He says the Democrats will “do what is necessary,” but they want some conditions. They are asking for an “oversight board” to supervise the operation, plus allowing bankruptcy judges to impose new loan terms in foreclosure proceedings, getting a stake in the banks in exchange for taking bad debts off their hands, and putting some limits on salaries of executives whose firms get handouts from the U.S. Treasury. Treasury Secretary Henry Paulson opposes any conditions, saying this could “limit market participation” – i.e., the banks would prefer to keep the worthless loans on their books and refuse to resume lending. But in very short order, they will come to a deal. Any conditions attached will be toothless, just sugar coating to make the bitter pill more palatable. The “independent” board proposed by Democrat Barney Frank to oversee the bailout is to consist of the heads of the Federal Reserve Board, the Federal Deposit Insurance Corporation and the Securities and Exchange Commission plus two “outside” financial “experts” appointed by Democratic and Republican Congressional leaders. Regardless of what hat they are wearing, this commission will consist of Wall Street bankers. The “regulators” will regulate themselves. Some “independence”! Moreover, the cause is not “lax regulation,” as the Democrats pretend. The crisis has hit the commercial banks as well, which are the most heavily regulated sector of the U.S. economy. The problem is not “free market fundamentalism” or “neo-liberalism” but capitalism. And even if Congress were able to legislate some or all of the Democrats’ riders, the bailout is still a mammoth payoff to the capitalist speculators. Many people understand this, if only instinctively. At the September 25 financial district labor demo, workers in hard hats were chanting “No bailout for Wall Street,” which was definitely not the program of the AFL-CIO chiefs. While the fat cats, Democrats and bureaucrats are all going for the Bush bailout to prop up U.S. capitalism, revolutionary Marxists oppose this trillion-dollar giveaway to the Wall Street speculators. No matter what “reforms” are tacked onto it, this giant bribe to finance capital is a crime against the working class, which is already suffering from rising unemployment and falling incomes. Instead of subsidizing the banks, we call for the expropriation of the financiers and the whole of the banking system the only way possible: through a workers revolution. Appointing the Treasury Secretary in charge of “regulating” the banks is putting the fox in the chicken coop. When Henry Paulson told Congress that “all we care about” is “the American taxpayer,” it provoked snickers in the audience. That has about as much credibility as the banks’ automated announcements that “your call is important to us” as you wait on line endlessly to talk to a real person. Paulson is the former head of Goldman Sachs, the one independent investment bank left standing. Another Goldman Sachs alumnus is White House spokesman Josh Bolton. And it’s not just the Republicans. The leading contributor to the presidential campaign of Democrat Barack Obama is . . . Goldman Sachs. And the Secretary of the Treasury under the Democratic administration of Bill Clinton was Robert Rubin, the former chairman of Goldman Sachs, who is currently head of Citigroup and one of Obama’s main economic advisors. Some “democracy”! The scope of this giveaway to the capitalist bankers is enormous. The $700 billion price tag is equal to the entire cost of the Iraq war. It comes on top of $565 billion already budgeted or handed out to Wall Street this year ($200 billion Federal Reserve loan program in exchange for mortgage-backed securities; $30 billion to JPMorgan for the takeover of Bear Stearns; $200 billion for the federal takeover of the Fannie Mae and Freddie Mac mortgage guarantors; $85 billion for the takeover of the AIG insurance giant; $50 billion to shore up money market funds) plus unlimited borrowing rights for top investment banks from the Fed’s “discount window.” But all that didn’t get the banks to start lending, and there is nothing to indicate the infusion of another trillion or so dollars will work either. In return for taking over “toxic” mortgage-based securities, the future of all sorts of social programs will be mortgaged. The enormous cost of the bank bailout will be used to nix spending for education, health care and other needs. Meanwhile, the ballooning federal debt is set to exceed $1 trillion this year and the bailout plan includes increasing the limit for the accumulated national debt to over $11 trillion dollars. This has already sent jitters through the international “financial community.” On Monday, the U.S. dollar suffered the biggest drop against the euro since 2001. Investors are worried that with Washington pumping so many billions into the economy, it will stoke inflation and reduce the value of their dollar holdings. For years, the United States economy has been fueled by enormous subsidies from the East Asian state banks which have bought up Treasury bills to cover the federal government’s budget deficits and the U.S.’ over $600 billion yearly international trade deficits. If the financial crisis sets off a stock market crash and a run on the commercial banks, it would be accompanied by a stampede on the American dollar, which since 1971 is sustained only by the confidence of the world’s central bankers who see holding greenbacks as a haven of stability. Once that confidence is gone, the whole house of cards could come tumbling down. The “meltdown” of the financial system could set off a “nuclear winter” in the global capitalist economy. The mushrooming financial crisis has raised fundamental questions. The New York Times (20 September) recently published an article advising readers on what to do with “Your Money,” where it wrote that in order to minimize risk, “Before you do anything with your portfolio, ask yourself this: Do you still believe in capitalism?” The Times editorialized that the bank crisis was due to “unfettered capitalism.” But what is their alternative? Like the Democratic Party politicians and union leaders, what they want is essentially “fettered capitalism.” But “regulating” the markets hasn’t stopped the boom-bust cycle of capitalism before, and it won’t do so now. Free-market ideologues like to quote the Austrian economist Joseph Schumpeter on the “creative destruction” unleashed by capitalism on outmoded economic structures. But today, as the wages and living standards of the working people are being steadily eroded, as social programs are drastically slashed, there is nothing creative about the destruction unleashed by the would-be masters of the universe. This is capitalism in decay, in its imperialist epoch of wars and revolutions. The only thing changed by “globalization” is to speed up the spread of economic crises internationally. There is a lot of loose talk today about “socialism for the rich,” particularly among right-wing Republicans (but also among some gullible leftists) objecting to the bailout. Among the financial wizards about to be laid off at Lehman Brothers there was gallows humor about the “People’s Republic of Wall Street.” But what is being proposed as a solution to the crisis in the center of world high finance has nothing to do with socialism. It is closer to the kind of corporatist regimentation of capitalism associated with Mussolini’s Italy. 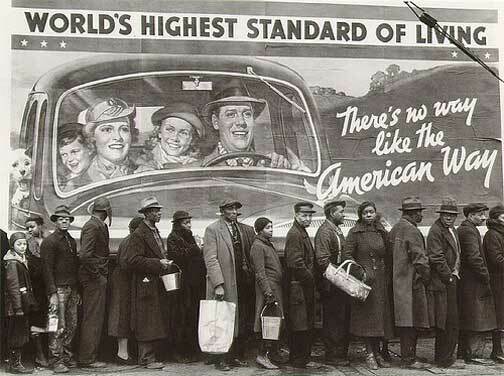 Illusion and reality, unemployment line 1937. And it goes hand-in-hand with the escalating elimination of democratic rights The rulers are ramming through the bank bailout with the same sort of scare tactics they used to enact the U.S.A. PATRIOT Act in the wake of the 11 September 2001 attack on the World Trade Center and the Pentagon. The result was a wholesale attack on immigrants, leading to the present Gestapo-like raids by the ICE immigration police, as well as warrantless government surveillance of millions of citizens that throws supposed Constitutional guarantees out the window. The latest “security plan” for New York, the “Lower Manhattan Security Initiative,” calls for a “ring of steel” around Wall Street, with mobile teams of heavily armed police and TV cameras at all street and subway entrances to the financial district so that they can scan the faces of everyone who enters the citadel of high finance. So demonstrate on Wall Street while you still can! This is not the first time that the ruling class has resorted to corporatist measures to shore up the tottering mainstays of U.S. capitalism. In the 1930s, Democrat Franklin Delano Roosevelt set up a number of quasi-government bodies in conjunction with corporate leaders under the aegis of the National Recovery Administration. According to liberal mythology, it was FDR’s Keynesian deficit financing, bank regulation and NRA corporatism that pulled the U.S. out of the Great Depression. But the reality is very different. The first post-1929 depression was followed by a second sharp downturn in the late 1930s, and it was only World War II that finally reduced the massive unemployment set the industrial economy running at full steam. Today as well, the roiling financial crisis that has hit stock markets and banks around the world points ultimately to a new imperialist war. The war on Afghanistan and Iraq likewise sets the basis for a world conflagration. The U.S.’ aim in the Near East is not to grab Iraq’s oil for its own use, but to control the production and distribution of this vital commodity in order to dominate their imperialist allies and rivals in Europe and Japan. Washington wants its hand on the oil spigot, and its “allies” are becoming restive. Speaking at the United Nations, French president Nicholas Sarkozy described the present U.S.-dominated financial system as “insane.” Ultimately, the war in the Near East, the financial crisis on Wall Street, the assault on democratic rights and the attack on the jobs and living standards of working people are all part of the same class war by the U.S. imperialist rulers pointing to a thermonuclear World War III. It has become a commonplace in the last week to call this the biggest economic crisis since the Great Depression of the 1930s. Some bourgeois economists are calling it the financial crisis of the century. In any case, it is far from over. Than Wall Street panic is only a step away from turning into a full-scale stock market crash, which would reverberate throughout the world. The banks are sitting on trillions of dollars which they are refusing to lend because they don’t know how exposed the other banks are to bad loans and they don’t know how much of their own mortgage-backed securities, credit default swaps and various derivatives are at risk. And as of last June the Standard & Poor’s 500 corporations (excluding the banks) have at least $650 billion in cash on hand (Financial Times, 24 August). Yet they are asking working people to foot the bill for rescuing the banks through their taxes. In the late 1930s, the Russian revolutionary Leon Trotsky put forward a Transitional Program to “help the masses in the process of the daily struggle to find the bridge between present demands and the socialist program of the revolution. This bridge should include a system of transitional demands, stemming from today’s conditions and from today’s consciousness of wide layers of the working class and unalterably leading to one final conclusion: the conquest of power by the proletariat.” In the present crisis, class-conscious workers should fight for workers commissions to open the books of the financial corporations to see what the stock market speculators and bankers have been up to. In the face of escalating unemployment and inflation, they should fight for a sliding scale of wages and hours, to share the available work among all hands and to raise workers’ pay so that it isn’t ravaged by inflation. There should be a massive program of public works under union control. Flag-waving “radical” protest on Wall Street, September 25, pushed reformist illusions. A main slogan was, “No deal for Wall Street, New Deal for Main Street.” FDR's New Deal didn't end 1930s Depression, imperialist world war did. In New York City, instead of trying to prettify the bank bailout, the unions should be preparing to strike against the multi-million dollar cuts that billionaire mayor Bloomberg has announced. This requires a fighting alliance with the black and Latino population in the ghettos and barrios, with immigrants, unorganized workers and students in the vast City University system. Such a class struggle would win support even from sections of the hard-pressed middle class. Labor has the power, as the 2005 New York transit strike demonstrated, to bring the city to a crawl. But to use that power requires a genuine “emergency mobilization” to rip up the anti-labor, no-strike Taylor Law. 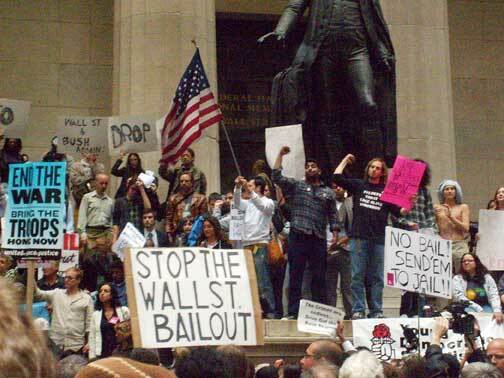 Various opportunist left-wing groups have seized upon the bailout issue to push their schemes to answer the financial crisis within the framework of capitalism. The Party for Socialism and Liberation (PSL), for instance, has set up a new website, votenobailout.org, where it declares: “instead of taking our tax dollars and giving it [sic] to the already rich and powerful, these funds should be used to provide ... decent-paying jobs, affordable housing, health care and a good education for our children.... Click here to send your letter to Congress.” This is the latest version of the “jobs not war,” “education not occupation,” ploy that all the reformists push. But the present financial crisis shows precisely that it is not a question of budget priorities. Even if there were no war or financial crisis, the ruling class is not going to pay for decent jobs, health care or education for the working people. Curiously, the International Socialist Organization (ISO) editorializes that “now that the U.S. government has carried out several quasi-nationalizations” like Fannie Mae and Freddie Mac, “why shouldn’t the public owner of these companies insist on a moratorium on foreclosures” (Socialist Worker, 19 September). The Socialist Equality Party (SEP), for its part, “propose[s] that the major banks and financial institutions be nationalized and turned into public utilities, operated under the democratic control of the working population.” And how is this to be accomplished? The SEP opposes unions and does not call for the mobilization of the organized workers movement. Instead it calls to support its candidates in the elections. Click to send a letter to Congress, convince “publically owned” (capitalist) corporations to stop foreclosures, pull a lever to vote for some pseudo-socialist: these nostrums peddle the illusion that something can be done about the financial crisis within the framework of bourgeois democracy (of which there is precious little these days). We print below an exchange of correspondence with Mitchel Cohen of the Brooklyn Green Party. I agree with the article you handed out at the Wall St. demo Thursday, "No to the Bailout of the Capitalist Speculators" (above). It contained some good information and was short on rhetoric – always a good sign. However, the end was, for me, problematic, and I want to discuss this with you in a non-polemical way. I don't particularly like "calls" for others to do something. Exhortations for workers to arise, or for some force "to forge a revolutionary workers party," or for "the mobilization of the organized workers movement," or whatever, just expose one's own impotence. Much better to write, "Here's what we are doing to achieve workers' revolution" or to "forge a revolutionary party" or to "mobilize the organized workers". In addition, you criticize several groups: the PSL, ISO, SEP, and, secondarily, the Greens and the Working Families Party. But except for the WFP, which is a front group for the Democrats, the grounds for your criticisms of the others make no sense. On the one hand, you uphold Trotsky's Transitional Program (and clearly define it), and on the other you criticize the other groups for issuing what are basically transitional demands. To criticize the PSL by saying that "even if there were no war or financial crisis, the ruling class is not going to pay for decent jobs, healthcare or education for the working people" may be correct, but that's exactly the purpose of such a statement -- it's a transitional demand as you've (and Trotsky) defined it. Same with the other organizations. So what actually comes across is a rather petty-sounding and not very theory-based attempt to distinguish your own group from the others, for no good reason. Now, I'm not saying that there aren't good reasons. I'm just saying that you can't uphold the Transitional Program as strategy on the one hand and then criticize other groups for employing it. The Internationalist replies: Thank you for your response to the leaflet we distributed at the September 25 Wall Street protest against the bank bailout. You raise an important question about transitional demands. As we noted, this is a continuation of the PSL’s “jobs not war,” “education not occupation” line which they share with a whole host of groups in the “antiwar movement.” The point we were making is that present financial crisis demonstrates that the issue here is not budget priorities – spend either on this (war) or on that (jobs, education, healthcare, etc.) – but rather a class question. Even though the ruling class is spending hundreds of billions of for their predatory imperialist war in the Iraq and elsewhere in the Near East, suddenly they can come up with a cool trillion dollars in an attempt to bribe Wall Street banks into lending the hoard of cash they are sitting on. Whether their ploy works is another matter. You find our argument “petty-sounding” and "not very theory-based,” because you see the PSL’s slogan as a “transitional demand” such as Leon Trotsky defined it. Yet Trotsky’s Transitional Program was a program for action by the workers movement to lead from the present demands of the laboring masses to show the path, or constitute a bridge, as he put it, to the fight for workers revolution. It was not a program to pressure the bourgeois state into altering its spending priorities. When the PSL, or Workers World, or the International Socialist Organization, or the rest of the opportunist left put forward calls like “jobs not war,” this is not an attempt to mobilize or prepare the working-class for independent action but an appeal to sections of the bourgeoisie to oppose the current war without opposing the imperialist system which produces those wars. This was what it meant when the German Social Democrats in the late 1930s called for “butter not guns” in response to Hitler’s war preparations. The SPD didn’t want to say that it was necessary to defeat German imperialism, to smash the Nazi regime, because they were appealing to the wing of the German bourgeoisie (including sectors of the military) that was worried that with his doctrine of preventive war Hitler might have gone too far. The purpose of today’s reformists in raising “money for jobs not war” and similar demands is the same. Just listen to Democrat Obama repeating the same argument in the September 26 presidential candidates’ debate with Republican McCain. The result of this line has been to drive the mass opposition to the Iraq war into the ground by pushing it into the arms of the Democrats, who have no intention of ending the war. They just want to shift the main theater of operations to Afghanistan and Pakistan. But are such calls “transitional demands”? Not at all. They are bourgeois pressure politics. You argue that their purpose is to expose that the bourgeoisie isn’t going to do that. But once that is established, how do such demands lead the masses to understand the need to mobilize independently to fight for power? In fact, because they don’t provide a program of class struggle, they tend to produce apathy. If antiwar forces want jobs for education/healthcare/jobs, and two-thirds of the population is against the war, and it doesn’t affect the direction of the government, most people just give up. The question is, who are we calling on to act? When we demand a sliding scale of wages and hours, for example, Trotskyists don’t tell the masses to send an e-mail to their bourgeois Congressman or woman. Instead we urge the workers to go into the streets and take over the factories like the Italian workers did in 1969 when they won the demand for a scala mobile to protect their wages against the ravages of inflation. When we call for workers defense guards, we don’t ask the bourgeois government to carry this out, even under a left-talking nationalist like Hugo Chávez. We advocate that the workers organize independently of and against the state as the German workers did in the early 1920s before they were crushed due to the criminal misleadership of Stalin & Co. When Trotskyists call for expropriation of a particular section of industry, we don’t do so by telling workers to send letters to their Congressional representative or the president, we do so in the manner of the Mexican workers who in 1937-38 struck the oil fields, organizing workers militias to occupy the facilities and challenging the Cárdenas government to expropriate them. Similarly on the demand for massive programs of public workers under union control. This is not a call for Congress to up its spending on pork barrel projects, with a pro forma reference to the unions tacked on. Trotsky argues that the demand for public works cannot have a progressive content unless it is linked to the fight for workers control. We would fight for this in the way the Minneapolis Trotskyists did in the late 1930s when they organized the WPA workers as a section of Teamsters Local 574, which they led, demanding a six-hour day, union-scale pay, union working conditions, reopening closed plants under workers councils, and striking against layoffs in 1939. These are some concrete examples to illustrate the general point that Trotsky makes, in his March 1938 discussions with Max Shachtman on transitional demands. “What is the sense of the transitional program?” Trotsky asks. “We can call it a program of action, but for us, for our strategic conception, it is a transitional program – it is a help to the masses in overcoming their inherited ideas, methods, and forms” to go from their present demands “to the slogan for the creation of a workers’ soviet.” To urge people to click their computer mouse to send a letter to their Congressperson is a caricature of a transitional demand. It does not lead workers in the direction of forming soviets, but in the opposite direction, of relying on the bourgeois state. You find exhortations on the workers to arise or to “forge a revolutionary workers party” only “expose one’s own impotence” and prefer writing about “here’s what we are doing.” It’s certainly good to write about what you are actually doing, and not just empty exhortations. But in order to do something, it is first necessary to call on the working class to act. For example, we have written about the May 1 West Coast port strike against the war, the first strike ever by American workers against a U.S. war. We have sought to explain in detail how this was accomplished, pointing to the strengths and weaknesses of the ILWU dock workers’ action. But we have been fighting for this for years. Since 1998, we have not only called for workers strikes against the U.S. wars on Iraq, Yugoslavia, Afghanistan and Iraq again, we also agitated among the West Coast dock workers for this and for “hot cargoing” war materiel. We helped build a labor conference to stop the war sponsored by ILWU Local 10 in the San Francisco Bay Area, and played an active role in helping prepare this action in every way we could. You might have found our calls “For workers strikes against the war” in 1998, 1999, 2001, 2002, 2003, 2004, 2005, 2006 and 2007, year in and year out, to be repetitive exhortations. Yet these were not abstract empty calls, and eventually they contributed towards a major development in the class struggle in the U.S.
Not that this makes the slightest impact on the opportunist left. Their attitude, by and large, has been, “Oh, the dock workers shut down the West Coast over the war, how nice. Now let’s move on to the real stuff, like our next antiwar conference.” The reason for this disdain and disinterest on the part of the reformists is that they are not at all interested in an independent mobilization of the workers against the war and against the capitalist war parties, but instead they want to tie all protests against the war to the Democrats and their bankrupt “strategy” of pressuring the bourgeois state. We call to forge a revolutionary workers party because breaking the chains that bind the U.S. working class to the Democratic Party is decisive in order to advance the class struggle. But revolutionaries also have an obligation to make clear what the alternative is: not another capitalist party like the Greens, or even a reformist chauvinist outfit like the stillborn U.S. Labor Party. On the Green Party, our article on “Capitalist Nader’s ‘Socialist’ Foot Soldiers,” in Revolution No. 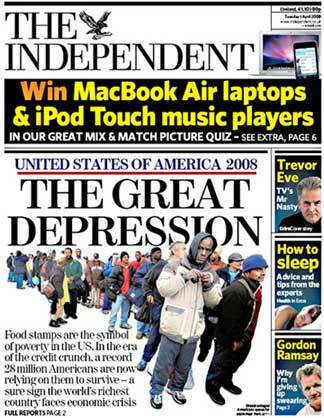 2 (October 2004), published by the Internationalist Clubs at the City University of New York, is a good starting point.